NHS West Lancashire Clinical Commissioning Group (CCG) is introducing an innovative new ‘red bag’ pilot scheme to help support care home residents when admitted to hospital. The bags, which contain key paperwork, medication and personal items like glasses, slippers and dentures, are handed to ambulance crews by carers and travel with patients to hospital where they are then handed to the doctor. 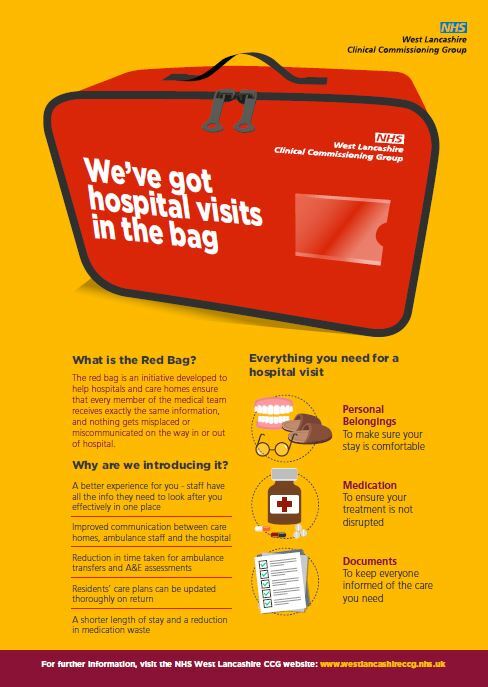 As well as giving reassurance to patients, the red bags provide hospital staff with quick, up-to-date information and medication requirements for the patient, avoiding unnecessary phone calls. John Caine, a local GP in West Lancashire and chair at NHS West Lancashire CCG, said: “This is an example of where a joined-up approach is helping to improve patient care and speed up a stay in hospital for all the right reasons. In West Lancashire, the pilot will initially launch at the start of July 2018 at the Cleveland House Care Home in Banks, with an aim to roll out fully across the region in September 2018. Mike Maguire, chief officer at NHS West Lancashire CCG, said: “Nationally, there are half a million more people aged over 75 than there were in 2010 – and there will be two million more in ten years’ time. They are also spending more years in ill-health than ever before.